Solutions and detailed explanations to projectile problems are presented . These solutions may be better understood when projectile equations are first reviewed. An object is launched at a velocity of 20 m/s in a direction making an angle of 25° upward with the horizontal. a) What is the maximum height reached by the object? b) What is the total flight time (between launch and touching the ground) of the object? c) What is the horizontal range (maximum x above ground) of the object? d) What is the magnitude of the velocity of the object just before it hits the ground? 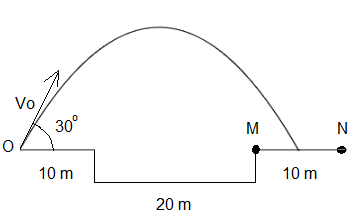 In the problem V0 = 20 m/s, θ = 25° and g = 9.8 m/s2. The height of the projectile is given by the component y, and it reaches its maximum value when the component Vy is equal to zero. That is when the projectile changes from moving upward to moving downward. (see figure above) and also the animation of the projectile. Time of flight = t2 - t1 = 2 (20) sin(θ) / g = 1.72 seconds. c) In part c) above we found the time of flight t2 = 2 V0 sin(θ) / g. The horizontal range is the horizontal distance given by x at t = t2. A projectile is launched from point O at an angle of 22° with an initial velocity of 15 m/s up an incline plane that makes an angle of 10° with the horizontal. The projectile hits the incline plane at point M.
a) Find the time it takes for the projectile to hit the incline plane. A projectile is to be launched at an angle of 30° so that it falls beyond the pond of length 20 meters as shown in the figure. a) What is the range of values of the initial velocity so that the projectile falls between points M and N? A ball is kicked at an angle of 35° with the ground. a) What should be the initial velocity of the ball so that it hits a target that is 30 meters away at a height of 1.8 meters? b) What is the time for the ball to reach the target? A ball kicked from ground level at an initial velocity of 60 m/s and an angle θ with ground reaches a horizontal distance of 200 meters. a) What is the size of angle θ? b) What is time of flight of the ball? A ball of 600 grams is kicked at an angle of 35° with the ground with an initial velocity V0. a) What is the initial velocity V0 of the ball if its kinetic energy is 22 Joules when its height is maximum? When the height of the ball is maximum, the vertical component of its velocity is zero; hence the kinetic energy is due to its horizontal component Vx = V0 cos (θ). A projectile starting from ground hits a target on the ground located at a distance of 1000 meters after 40 seconds. 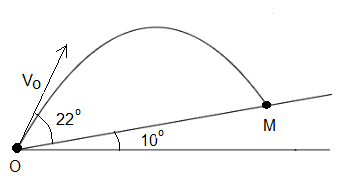 a) What is the size of the angle θ? b) At what initial velocity was the projectile launched? We now use any of the two equations above to find V0. 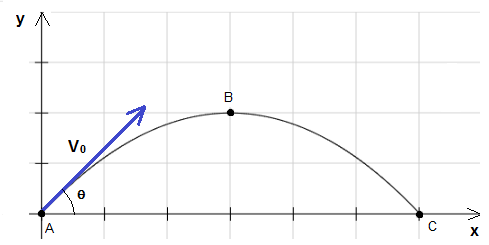 The trajectory of a projectile launched from ground is given by the equation y = -0.025 x2 + 0.5 x, where x and y are the coordinate of the projectile on a rectangular system of axes. a) Find the initial velocity and the angle at which the projectile is launched. Two balls A and B of masses 100 grams and 300 grams respectively are pushed horizontally from a table of height 3 meters. Ball has is pushed so that its initial velocity is 10 m/s and ball B is pushed so that its initial velocity is 15 m/s. a) Find the time it takes each ball to hit the ground. b) What is the difference in the distance between the points of impact of the two balls on the ground?